On an April afternoon in Brooklyn, dancers gather around their teacher for an Afro Caribbean dance class. Some are dressed in t-shirts and stretchy pants, some have their socks on, others go barefoot. The students are mostly over 60, but some are younger, with companions ready to join them in dance. Soon, the drummer begins and it’s time to warm up. The dancers stay seated for this part. But before long, they’re up, migrating across the floor as they repeat a new step, their arms raised high in the air, as if they’re rejoicing in a rainstorm. 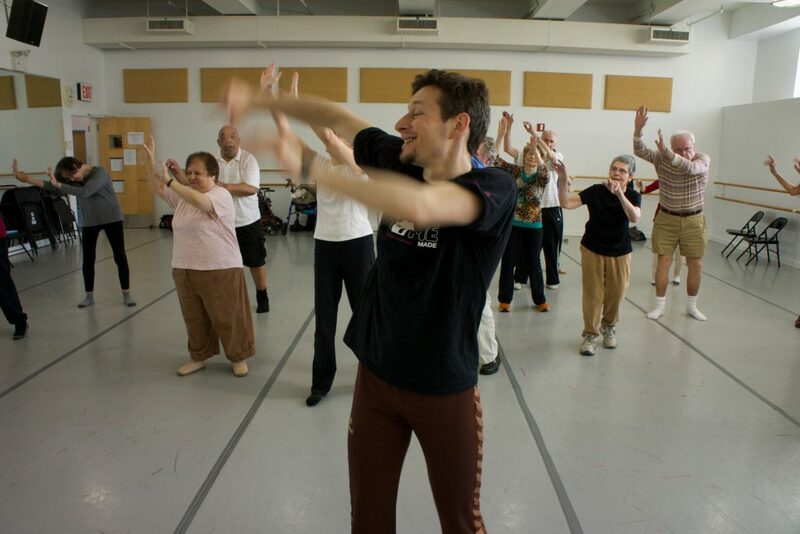 This class is much like any dance class in the world, except here, all the students have been diagnosed with Parkinson’s Disease, a progressive nervous system disorder that can cause shaking, tics, stiffness and slowed movements. 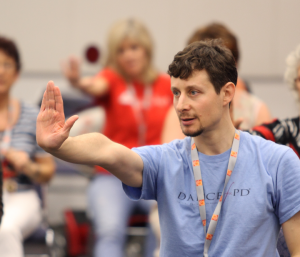 David Leventhal, a co-founder and Program Director of Dance for PD, started teaching these classes 16 years ago. Leventhal, who moved to New York to become a professional dancer in 1996, was working for the Mark Morris Dance Group in the fall of 2001, when a woman named Olie Westheimer approached the company. 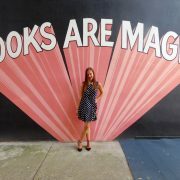 Westheimer was the founder and Executive Director of the Brooklyn Parkinson’s Group. She asked the dance company, which had just opened a new studio in Brooklyn, if teachers there would create a dance class for Parkinson’s patients — without treating them like patients. At that time, researchers were already studying the ways that dance could benefit those with Parkinson’s, as well as those who’d had strokes or traumatic brain injuries. But as a classically trained professional dancer with no personal link to Parkinson’s, none of that research was on Leventhal’s radar yet. This class is much like any dance class in the world, except here, all the students have been diagnosed with Parkinson’s Disease…. Leventhal wasn’t even supposed to teach the first Dance for PD class, his friend and colleague John Heginbotham was. But at the last minute, Heginbotham got called away on a family matter. “When he came back, I said, John, that was so fun. Could we do this together?” Leventhal said. That first class had eight participants and went well, as Leventhal learned how to simplify dance sequences to make them safe and fun, while still challenging students with an interesting mix of movements. So the Mark Morris Dance Group continued hosting the classes once a week, with Leventhal and Heginbotham teaching classes together. “John and I just had a great relationship, we were able to create a great relay because John is a choreographer who does more on the improv side, where I was more about ballet technique,” Leventhal said. They taught ballet but also modern dance, improvisation and jazz. Eventually, in 2015, the company expanded to include master classes in Irish dancing, Middle Eastern Dance, Flamenco, and others. But the program offered more than just an intro into various kinds of movement; it gave students the chance to shed their identity as patients and become creatives, to focus on creating movement rather than “fixing” their bodies. [Dance] gave students the chance to… focus on creating movement rather than “fixing” their bodies. Leventhal watched as the experience improved student’s lives inside and outside the studio. And, he said, he watched the students getting bolder, less fearful. “I saw them trying things in class that they may have not ordinarily have thought they could do. And that built their confidence to try other things in class or in another movement class, or to try totally different things, like singing. Even walking became easier for some dancers who had seen their walking slowed, impaired and sometimes “frozen” by the effects of the disease. 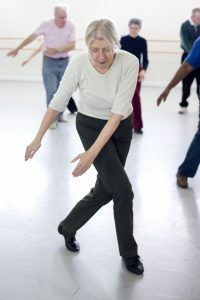 Right now, Leventhal is working with researchers from Columbia University and the University of Washington in St. Louis, to study whether dance can help people with Parkinson’s walk at a faster pace, the way they did before the disease began to progress. Remarkably, Leventhal said, dancers don’t even have to be physically doing the dance to reap the benefits of Dance for PD. “We give permission for people to sit and look, too … because watching dance is almost as beneficial as dancing. Your brain is going through the same action and firing in the same way that it is when you’re doing it,” he said. 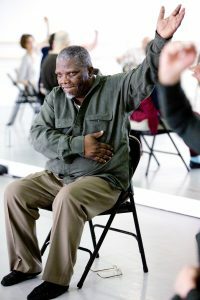 For many students, Leventhal said, Dance for PD has given back a sense of mastery over the body and movement that Parkinson’s threatened to take away. “It’s satisfying for them (to dance) … Because the rest of their movement lives are frustrating. They don’t feel mastery of things like walking or turning around,” he said. 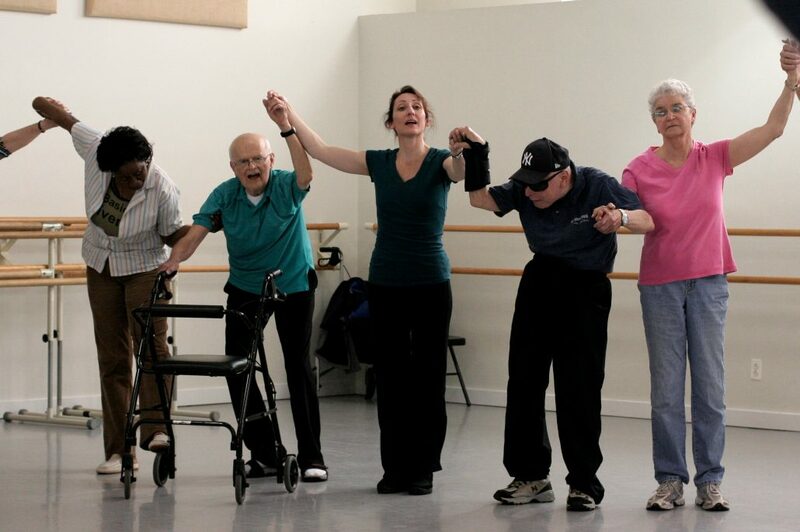 Leventhal’s observations are backed by numerous studies that have now been done on the benefits of dance for people with Parkinson’s. 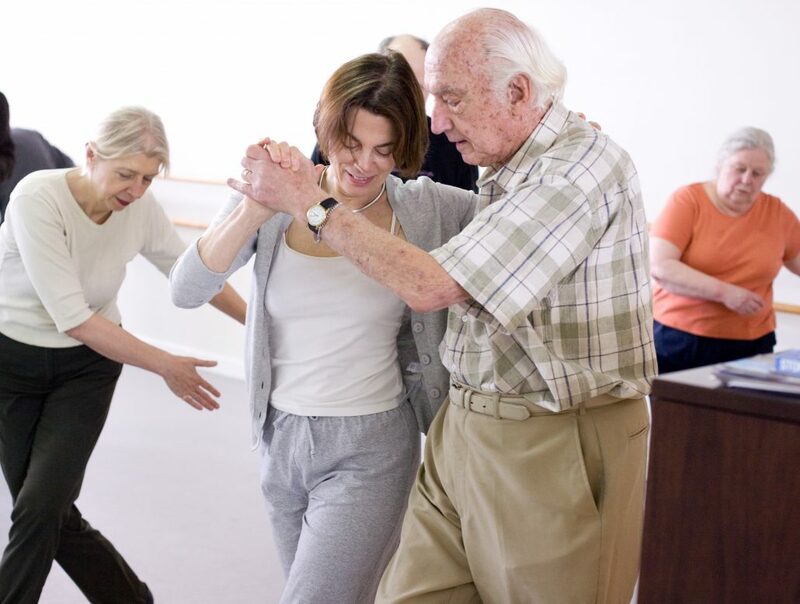 In studies that compared the effects of walking versus Tango classes on elderly, frail participants, for instance, both kinds of exercise made people stronger. But people who danced saw their balance and walking speed improve more. And after the trial ended, more than half the people in the Tango group kept going to class, while none of those in the walking test group continued to walk for exercise. It’s the joy of movement and the sense of community that may set dance apart from other kinds of beneficial exercise, which explains why Dance for PD is now taught around the world, with approximately 6,000 participants taking Dance for PD or Dance for PD-inspired classes. New York has eight different Dance for PD classes, including the one in Brooklyn. And trainings for new teachers happen every year around the world in cities like Shanghai and Madrid. For this who can’t make it to class in-person, or want to dance more than once a week, Dance for PD puts out DVDs and a monthly livestream class. It’s also developing an experimental app with Google Glasses to help people with Parkinson’s walk more easily. Leventhal said that teaching the classes has made him a better teacher overall. Splash photo by Eddie Marritz.